The Rules of succession on intestacy to personal property. Personal property goes to the next of kin (i.e. the nearest in relationship), but among the nearer relations there are some special rules. (i.) =£500 (or a proportionate part of it) if the conditions stated on p. 92 are fulfilled. (ii.) half the remaining personal property absolutely. I. To descendants "per stirpes" (i.e. by families, or stocks of descent). There is no preference for male over female, or eldest over youngest. All the children take equally, but if any are dead, all their children stand in their place. II. If there is no issue, the father takes all. III. If the father is dead, then the mother and brothers and sisters take in equal shares, and if the mother or any brother or sister is alive, then the children (but not other issue) of any brother or sister who has died leaving issue take his or her share. Thus O (the owner) leaves his mother M and 6 nephews and nieces, the children of his brother B and of his sister S.
Here, the mother being alive, the children of 33 and S, who are dead, stand in their place, 1/3 goes to M; 1/3 to the child of B; 1/3 to the 5 children of S.
But if B's child (N1) had died leaving two children, these grandchildren of B would not take any share. Note. - If the mother had been dead this rule would not apply, but the estate would be divided according to the next rule. IV. If the mother and the brothers and sisters are all dead, the next of kin take according to their share, per capita. 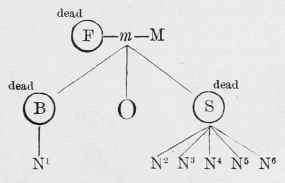 Degrees of relationship are calculated by counting each step up to the common ancestor and then down to the relation in question. 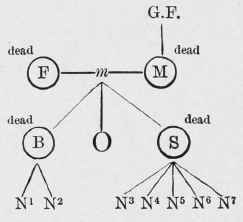 M, B, and S, being all dead, the nearest in relationship takes: i.e. the grandfather, G.F. If G.F. were also dead, the two nephews and the 5 nephews, being in the 3rd degree, would take per capita: i.e. by counting heads, without regard to families. Thus the 7 nephews would take 1/7 each. V. Relations of the half blood take equally with the whole blood. This is very different from the rule in real estate, and is perhaps the one case in which these rules are not so sensible as the rules of inheritance of real estate.